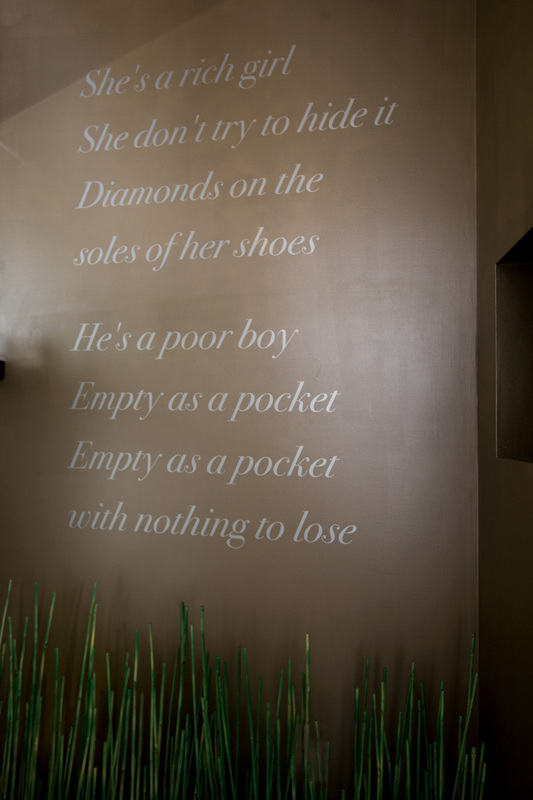 Kooby applied song lyrics to the walls of a client’s home. Kooby uses online companies that offer customized stencils, and removable large-scale murals and decals. In one client’s bathroom in a completely renovated house in Morningside, she put up a customized decal of song lyrics. She also commissioned an enormous, multicolored mural for a project last year as part of the Atlanta Food and Wine Fest. Chef Kevin Rathbun chose Kooby as a “One to Watch” Southern designer and for a party featuring local designers paired with up-and-coming chefs, Kooby was to design a space at the Atlanta Decorative Arts Center (ADAC) in Midtown for Chef Digby Stridiron of Balter restaurant in the U.S. Virgin Islands. Stridiron “uses all local, sustainable, mostly organic foods in his dishes, so I wanted the space to reflect that, also to have a subtle island feel,” Kooby says. The custom made vinyl mural, with sea blue and white that evokes water, took a few helpers to stick to the wall, but “it looked sensational,” she recalls. Kooby also hung a large world map decal in her son’s old bedroom in Morningside to add interest to the space. “The nice thing is that you can take these [murals and decals] down and hang them up again,” she says. 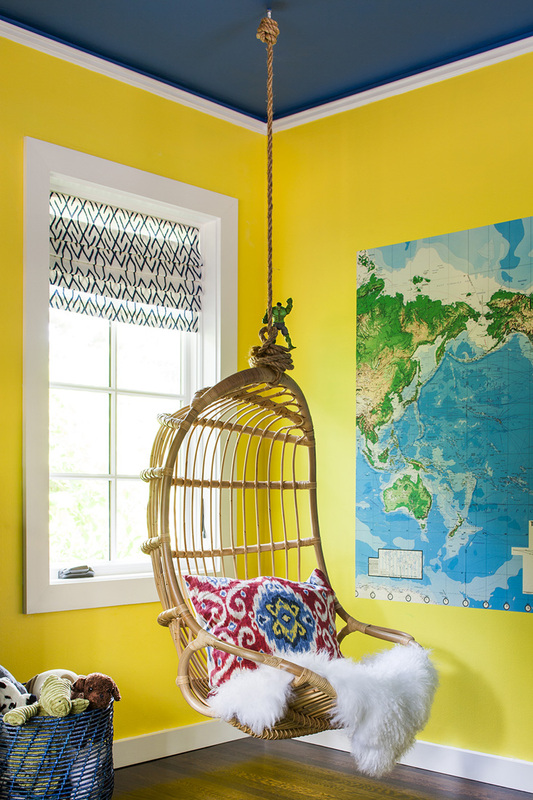 The color- and texture rich Morningside bedroom Kooby created for her son. Stencils can be more challenging, but Kooby encourages DIYers to give them a try, even on the floor. 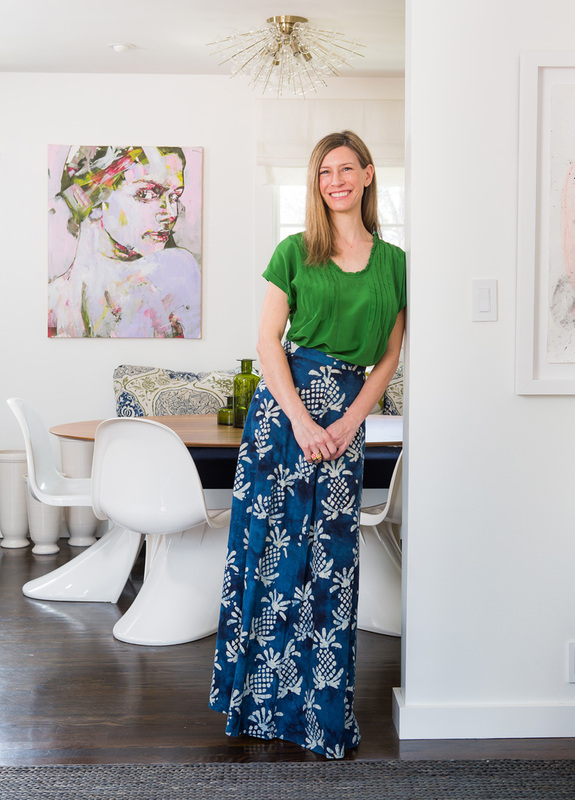 “If you have an older home and the floors aren’t great, and you don’t want to refinish them, you can paint them,” she says. One online company she orders from sells a series of mandala stencils she covets, for their intricacy and beauty. A mandala is a complex geometric symbol, an ancient spiritual symbol in Buddhism and Hinduism but in modern times, used to represent the cosmos. “How awesome would that be on a floor?” she says. Before adding a stencil or decal, Kooby says to give base color paint at least one day to dry. Winter is a time of heavier, darker fabrics on sofas, curtains and pillows. Come spring, simply changing out sofa pillows for ones with fabrics such as linen or cotton can lighten the feel of a room, says Cooper. 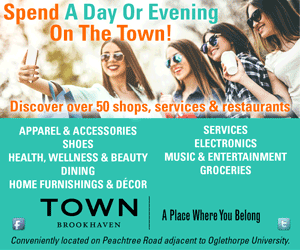 “You can refresh your space without breaking your budget” by purchasing throw pillows at discount stores, she adds. If you want to get crafty, Kooby suggests creating new pillows from brightly colored and patterned vintage scarves.